Of all the mistakes athletes make in their quest to get stronger and faster, most can be attributed to lack of education and awareness. Too much weight. It’s important that athletes challenge themselves with heavy weight. That’s one of the ways to engage fast-twitch muscle and build strength and power. And, although we don’t encounter this very often with our female athletes, it’s a common issue with the guys. The result is poor technique (which could be added to this list) — bad form and biomechanics — and an increased risk of injury. Lifting a challenging weight with proper technique, through a full range-of-motion, is more effective and safer than overdoing it. Not enough total-body training. Once again, more of a problem with the guys (sorry, gentlemen), who are enamored with exercises that focus on their chest and biceps (in fairness, we also work with some females who are more than a little preoccupied with exercises that focus on abs and butts). Think of your body as one, big, interconnected (and inter-dependent) functional unit. More of your training should be movement-based, as opposed to muscle-focused. Lack of variation. Traditional, iron-pumping exercises are still some of the best for building strength and power, but we also use tools like kettlebells, medicine balls, stability balls, TRX suspension trainer, Rip Trainer, Blood Flow Restriction (BFR) bands, and balance-focused equipment like the Airex pad and BOSU. Diversify your program by performing different exercises — using a variety of equipment — for similar movement patterns. Overtraining. This includes too much frequency; too much volume; too much focus on the same muscle groups; and too little rest. The result is often an increase in the potential for injury. Be smart. The goal isn’t to do as much as you can; the goal is to do as much as you need to in order to achieve your goal. Bad nutrition. Another area of improvement for most of our athletes. Virtually everything we do is fueled by nutrition and adequate hydration. Quality, quantity, and frequency of meals and snacks are key components of performance nutrition; and dehydration is the primary cause of fatigue-related performance decline. Inadequate rest/sleep. Remember, it’s the “rest” phase that provides working muscles the opportunity for regeneration and growth. You need to be training hard, eating right, and sleeping right to ensure continuous improvement. Here’s a related article from my friends at WeckMethod, Functional Training: Top 5 Mistakes. Get some help. An experienced, qualified strength and conditioning professional can provide expert advice, guidance, and direction; and make a big difference in your development. One of our preferred strategies when training athletes (and virtually every other client) involves minimizing rest intervals among and between sets. Maintaining an “up-tempo” pace — keeping the heart rate up during a workout — results in continuous improvement, regardless of fitness level. There’s no need to be in the weight room all day. Most of our clients’ sessions are about 45-50 minutes in duration, and there’s very little “down” time. They get in, get their work done, and get out (and recover). We’ve found that agonist-antagonist paired sets (working opposing muscle groups — pushing and pulling — e.g., the bench press and row) are a great way to maintain an aggressive workout tempo, improve workout efficiency, and reduce training time, while not compromising workout quality. In addition to strengthening muscles, this strategy strengthens and stabilizes joints and helps prevent injury. Our athletes and clients perform the paired exercises, back-to-back, completing all sets with as little rest as they can manage, then rest for one minute before proceeding to the next pair of exercises. We also vary our training programs, changing exercises weekly, while ensuring that each session is a total-body workout. Performing different exercises for similar muscle movements is important to keep workouts challenging. High-intensity interval training (HIIT) is another terrific way to maintain an efficient, up-tempo workout. HIIT involves alternating high- and low-intensity exercise over a pre-determined period of time. We like a ratio of 1:3, high-intensity to low-intensity, as a benchmark, depending on the athlete’s/client’s fitness level. We train hundreds of athletes, and one of the things they all have in common is that they come to us with strengths and areas for improvement (I like that term better than “weaknesses”). And, certainly, even their strengths can be improved. The first step is identifying and understanding the athlete’s area for improvement and developing a plan to strengthen it. A baseline assessment is a good starting point, and it’s also helpful to watch the athlete play his/her sport of choice. Typically, we all gravitate toward our own comfort zones, and athletes are no different as it relates to their training. The average athlete will avoid certain exercises when that should be his/her focus. We don’t ignore or neglect areas of strength, but we focus on exercises in which athletes are the weakest (exercises they typically avoid). Some athletes may need more attention to improvements in balance and stability; others may benefit from core strengthening. They all have areas they can improve. Regardless of the athlete’s area for improvement, our focus is on training movements, and not just muscles. 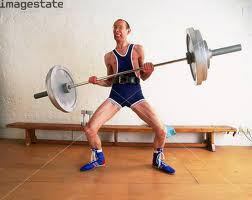 Some of the athletes we train are already pretty strong. We want to help them better leverage and apply their strength in a way that’s relevant to the sport they play. Our goal is to try and make them faster; more explosive; more balanced and stable; and more mobile and flexible. And this isn’t limited to just running and jumping. We want to make all their muscle movements faster and more powerful. Although we use a lot of “traditional” weight training exercises (sometimes, they’re still the best), we also favor stuff like blood flow restriction (BFR) training, suspension training, anti-rotational training, and body-weight exercises. The key is to emphasize speed, agility, quickness, acceleration, power, and metabolic conditioning along with strength and flexibility. All of these aspects combine to create a better athlete. Here’s a nice article from Men’s Health titled, 5 New Rules of Super Strength. The five training “secrets” discussed in the article echo our training philosophy at Athletic Performance Training Center. Getting stronger means not only working hard, but also working smart. These five strategies can help any athlete take his or her training — and results — to the next level. Quality trumps quantity. A longer workout is not necessarily a better workout. Keep your intensity level high by minimizing rest intervals and using supersets (we favor agonist-antagonist paired sets). Learn to react faster. The ability to react and respond quickly can be a game-changer, and can be developed and improved with practice. Add contrast training. As stated above, high intensity workouts are best. Follow a strength exercise with an explosive movement (e.g., perform a set of squats, immediately followed by a set of squat jumps) to recruit more motor neurons and trigger a surge of muscle-building hormones. Finish fast. You won’t build fast muscle-memory by moving slowly. Finish your workout with speed work. 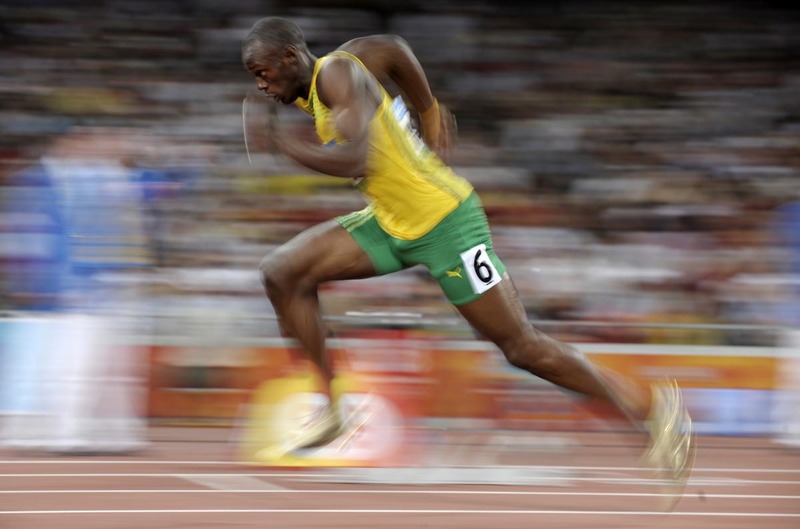 Speed is a (insert cliché) difference maker/game changer/game breaker in virtually every sport. It can be the difference between starting and sitting; winning and losing. And agility, or “quickness” (which is basically the speed at which an athlete is able to accelerate, decelerate, change direction, and react), may be even more important than “straight-line” speed (and certainly more relevant in most sports). 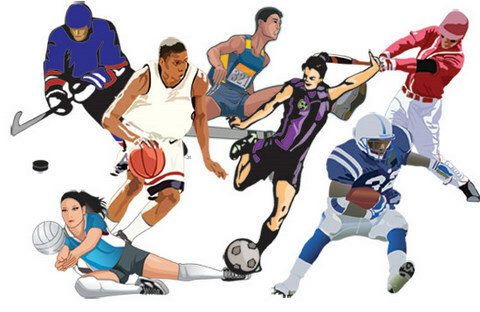 I hear a lot of people talk about sport aptitude/IQ and sport-specific skills (e.g., ball-handling and shooting, in basketball), and both are important. But, as you ascend through higher levels of sport participation — middle school, high school JV, varsity, college, one thing is certain: If your opponent can outrun you, you’re at a competitive disadvantage. Conversely, if you can outrun your opponent, the advantage becomes yours. Not everyone has the potential to be fast, but everyone has the potential to be faster. It’s also a smart idea to consult with an experienced, qualified Strength and Conditioning Professional, to ensure that your plan is well-designed and -supervised. A study from Tulane University in New Orleans corroborates that a low-carbohydrate diet is better for losing weight and may also be better for lowering the risk of heart disease than a low-fat diet. 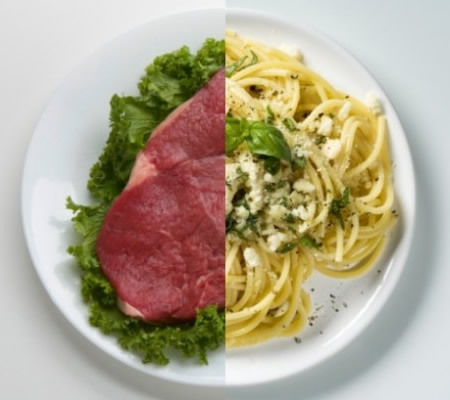 Please see related blog posts, Fat is not the Enemy and Eating Fat Won’t Make You Fat. Above all, remember that moderation — portion control — is the key. “We all have our own reasons for going to the gym, but everyone has at least one common motivation—the desire to be healthy. Getting in shape is no easy feat but it turns out the very tool that should be helping us—the gym—may also be temporarily derailing our efforts,” according to Diana Gerstacker, Editor at The Active Times. Gyms, exercise facilities, and health clubs are often breeding grounds for fungal, viral, and bacterial infections. In her article, The 9 Dirtiest Things at Your Gym, Diana discusses the most likely areas bacteria is lurking at your gym (it’s everywhere) and how you can take steps to avoid it and keep yourself healthy. If you’re sick, stay home. Incessant, sickness-related coughing and sneezing has no place at your workout facility. Opt, instead, for a home workout until symptoms subside. Wipe down the bench and use a towel. No one wants your sweat on the equipment they’re using, but it doesn’t matter how much — or how little — you sweat. Make sure there’s something between you and the bench (shirt, towel, etc.) and wipe down any surfaces with antiseptic wipes before or after use. If you touch it (or come in contact with it), clean it. Same rules apply to exercise mats, barbells, dumbbells, kettlebells, medicine balls, etc. Don’t eat or drink on the gym floor. Keep your water, snack, and/or sports beverage in the break area. Dress appropriately. While you’re not expected to “bundle-up” in a warm gym, cover as much of your body as conditions reasonable allow. Wear long-sleeved tops and pants rather than shorts and tank tops. Use your gym towel wisely. 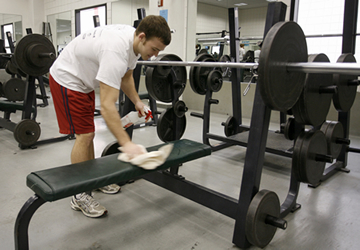 If you use your towel for wiping the gym equipment, don’t use it on your skin. Cover open wounds. If you have cuts or bruises keep them bandaged; you don’t want to make them worse. Here’s a nice article from STACK expert, John M. Cissick, titled, Get Faster With 3 Essential Speed Training Strategies. John’s article echoes the same advice and guidance we’ve shared with our athletes, over the years. Strength training provides the foundation so, first and foremost, get in the weight room. As stated in a previous blog post, Speed Development Starts in the Weight Room. You’ve got to get stronger in order to improve your ground reaction force and, ultimately, your speed. Lower extremity strength exercises that focus on the hips, quadriceps, and hamstrings should be a part of each and every workout. Plyometrics are exercises that “teach” your muscles to generate force quickly. They are the most effective way to build lower-extremity power. It’s important for young athletes to build a strong foundation, first, before proceeding to plyometric exercises. Speed training is an important part of the process, because you have to learn how to use the strength and power you’ve developed. Quality repetitions, technical correctness, and adequate rest intervals should be factored into your training plan. For more information, please refer to Speed Training and Development (get faster! 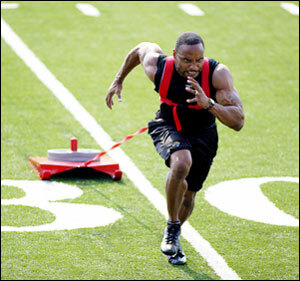 ), Key Elements of Speed Training, and Maximize Your Speed Workouts. Vertical jump performance is important in several sports — basketball and volleyball being two team sports that come to mind. Previously, I’ve discussed jump performance in my articles, 6 Ways to Jump Higher, and Improve Your Vertical Jump Performance with Jump Training. Additionally, I’ve established that Jump Training Should Include Landing Mechanics. This is especially important since jump landings are associated with high ground reaction forces. Incorrect landing technique, insufficient muscular strength, and lack of balance place the lower extremities at risk for injury. Female athletes are known to have a higher risk of injuring their anterior cruciate ligament, or ACL, while participating in competitive sports. The chance of ACL tear in female athletes has been found to be 2 to 10 times higher than in male counterparts. Recent research points to differences in the biomechanics (the way our bodies move) of male and female athletes. Although it’s impossible to prevent every injury, the good news is that we have the ability to change the likelihood of ACL tear, and jump-landing mechanics/training is at the top of the list. An effective jump-landing program starts with education, and — as shown above — includes a variety of components. Additionally, to ensure athlete compliance, the training program should be designed to equally address performance and injury prevention.